Stay Tuned for my upcoming DVD Giveaway! Greg Heffley is about to discover that there is something worse than middle school – his own family! 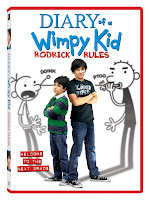 Based on the 2011 Nickelodeon Kids’ Choice™ Award for Best Book Series, the original film cast returns in DIARY OF A WIMPY KID: RODRICK RULES, available on Blu-ray and DVD on June 21st. For Greg and Roderick’s mother, Susan( Rachael Harris, The Hangover), having a full house can take it’s toll, especially with these two. This flick takes sibling rivalry to entirely new levels as big brother and little brother wrestle through growing pains. Just back from summer vacation, Greg Heffley (Zachary Gordon, National Treasure: Book of Secrets) and his friend Rowley (Robert Capron, The Sorcerer’s Apprentice) enter the next grade as undersized weaklings in their school. A bully favorite, Greg tries not to get noticed by anyone except the pretty new girl, Holly Hills (Peyton List, 27 Dresses). 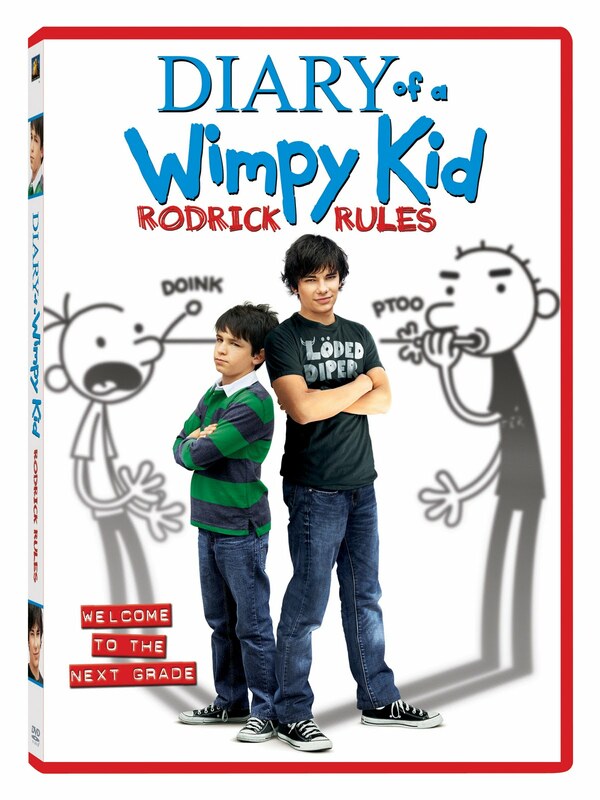 And at home, Greg is still at war with his older brother, Rodrick (Devon Bostick, “Degrassi”), until their mom Susan instigates a ‘Mom Bucks’ program so Greg and Rodrick can earn play money by doing chores and—gasp!—being nice to each other. Calamity ensues when their parents return from vacation and dad Frank (Steve Zahn, A Perfect Getaway) finds evidence that Rodrick secretly threw a houseparty with his band, Löded Diper. As they struggle with school and compete for ‘Mom Bucks,’ the brothers discover that avoiding trouble is easier if they unite—and their once-twisted partnership grows into a hilariously playful and sometimes mischievous friendship. If you’re like Susan, and you have a bunch of unruly kids on your hands, it’s time to kick them into shape with our fool proof chore list that is sure to keep your kids busy all summer! Have your kids earn their “Mom Bucks” by taking care of their chores. With hints and tips on what to have the kids assist with including; taking out the trash, washing the car and tidying their room – there’s no reason why a little ‘Susan’ inspired discipline won’t have your household running smoothly. It’s no mystery that kids hate cleaning their rooms. A nice mommy trick is to make the process of organizing and picking up fun. Think of ways to keep your kids mentally engaged so that it doesn’t feel too much like work, or at least make them think it isn’t work! Try reading them a chapter from an excited book as they keep their little hands moving. Consider renting out books on cds when you have a full plate and need some mommy solo time. It’s a chore that needs to be done everyday, and sometimes more than once, when you have a full house of kids. Give your kids a schedule for trash duty. Assign your kids their own “trash day” so that they know, say, “Wednesday” is Tommy’s day and “Monday” is Susie’s day. Keep your kids on this routine so they don’t get off track. Before you know it, you might not even have to remind them. One can only dream! Washing the car is a good chore for your pre-teen/teen to get started on. In fact, they might find it a fun acitivity to do during the summer. Suggest a “car wash party” and have them invite a couple of their friends over to help out. Kids love a good splash fight and their reward can be pizza for everyone. Another chore that is ideal for the pre-teen/teen age group is helping to do the laundry. Teaching your kids how to do the laundry is an essential tool they will need in the future. Get them started early so they make it a part of their weekly chores. Eventually, they should be able to wash their own clothes. For the smaller age group, have them help you fold the laundry. Make it a game of color coordination and have them group the folds by colors. Washing dishes is probably one of the least favorite things to do in chore world. Even for super Mommies! Like taking out the trash, kids should have a “dish day” and it should be a part of their regular routine. Another trick, is to have everyone clean up after themselves individually. Make it so that everyone washes their own dish after dinner is wrapped up. That way, no one gets stuck with wrinkly hands and it saves everyone, especially Mommy, lots of time! Disclosure: I was provided with a DVD for an upcoming giveaway in exchange for posting this information.